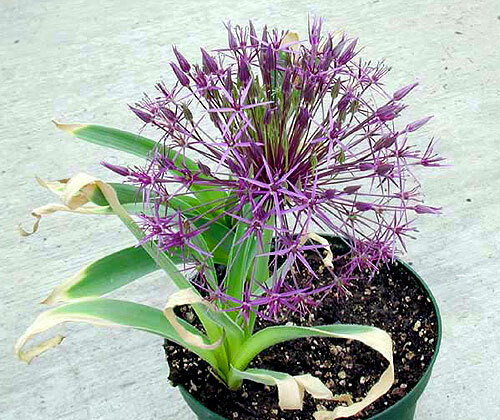 Showy and unusual, the Star of Persia Allium's flowerhead can be up to 1 foot in diameter. Nearly 100 metallic violet flowers create a starburst-like bloom that resembles an exploding firework. Adds drama to either fresh or dried flower arrangements. Prefers fertile, very well-drained soil. Blooms are violet with a metallic shine. Leaves die back before plant blooms. Spherical flowerhead borne on a tall erect stem. not native to North America - Native to Turkey, Asia Minor, Central Asia. 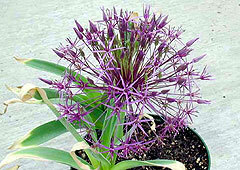 Propagate by division or separation - Plant the bulbs 4" beneath the soil surface in fall. Apply mulch in fall for winter protection.